lime | eat. drink. cook. travel. 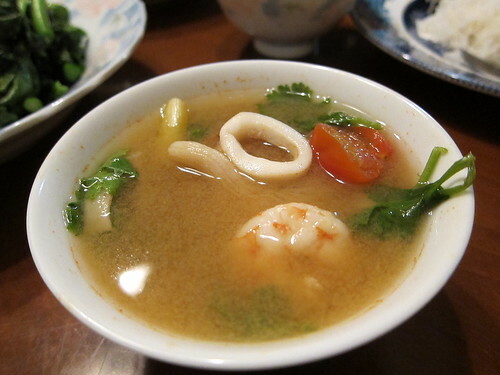 One of my favourite soups to make at home is tom yum soup. 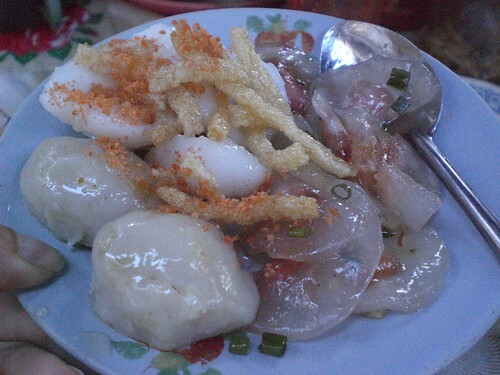 I learned a version of it at the Chiang Mai cooking school and never looked back since. It’s dead easy to make from scratch and even adding tom yum paste is optional. Granted, the ingredients aren’t the easiest to find, but I’m finding that more and more shops are stocking them. Some of my local supermarkets even sell tom yum starter packs with lemongrass, galangal, kaffir lime leaves, garlic, shallot, lime and chilli in them. What I normally do is buy a bit more of the herbs when I see them, prepare them and chuck them in the freezer. With a bit of forward planning, a fragrant spicy soup can be made from frozen to tummy in minutes. If you’d like the soup a little spicier, there’s no need to add more chilli, just pound the chilli padi into smaller bits. For today’s soup, I had some seafood and plenty of prawns and their shells. I also had some spare chicken bones and made a lovely stock from boiling the bones and the prawn shells and heads together for about 10 minutes. The prawn heads, especially when I squeezed out the orangey guts, gave the stock an intensely briny prawn flavour. You can make the soup with plain water, it’ll still be fragrant but not as robust. Make stock from the prawn shells and head by boiling them in 2 litres of water for 1o minutes. Strain the stock into a separate pot for making soup. Add the garlic, shallot, galangal, kaffir lime leaves, lemongrass and chilli padi to the stock and bring to a boil. Next, add the prawns, squid, tomatoes and mushroom and bring to the boil again. Off the heat, add the lime juice and fish sauce sparingly, tasting as you go along, till you get the right balance of sour and salty. Serve, garnishing with coriander leaves. I was so inspired by the Viet chicken rice in Hoi An that I absolutely had to make my own. 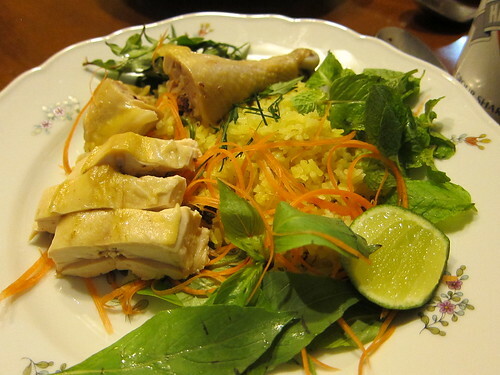 I started off on a typical Hainanese chicken rice base. Not having access to the type of chicken (most likely cornfed) that coloured the rice yellow, I improvised by adding turmeric to the rice base. For the chicken, I poached it the Hainanese way. 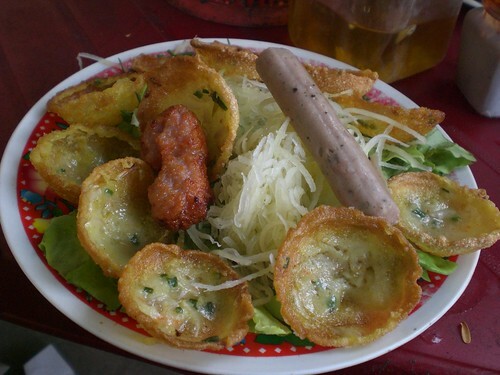 However, the toppings were very much improved with plenty of typically Vietnamese herbage. Even in the absence of Hainanese chilli sauce, I thought this was a winner. It also passed the family test: every grain of rice was gobbled up even though I deliberately cooked more in the hope of leftovers. I can imagine it being even more magical with Hainanese chilli sauce. Wash rice and put in rice cooker pot. Measure out how much water you’d put in and keep that amount in mind for the stock to use, about 450ml. (I use the “equal finger” method: stick your finger in the rice, and add water to the same level above the rice.) Now drain the rice and set aside. Put chicken in pot and cover with water. Heat gently till just boiling and simmer for 5 minutes. Turn off fire and leave for 30 minutes. Remove chicken and set aside. Keep all stock and juices from chicken. When cool, rub with salt and sesame oil. Fry garlic, shallot and ginger in oil till fragrant, then add cloves, star anise, cinnamon and fry for a few seconds more. Add rice and fry till it’s dry and glistening. Transfer to rice cooker and and chicken stock. Squeeze the pounded turmeric over, discarding the dry turmeric pulp. Season with a pinch or so of salt. Cook as normal. Chop chicken and prepare herbage for serving. 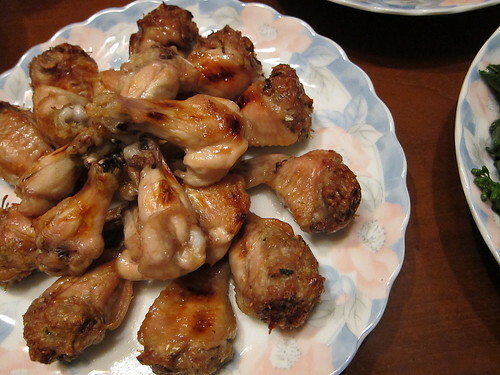 Before eating, arrange chicken on top of rice and top with carrot shreds and herbs. Squeeze the lime over and tuck in. 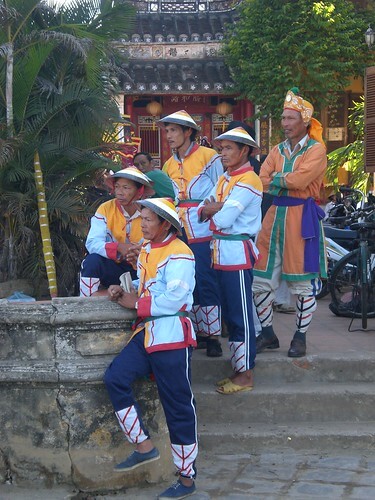 Back in Hoi An, a great deal of colour and eating beckoned. 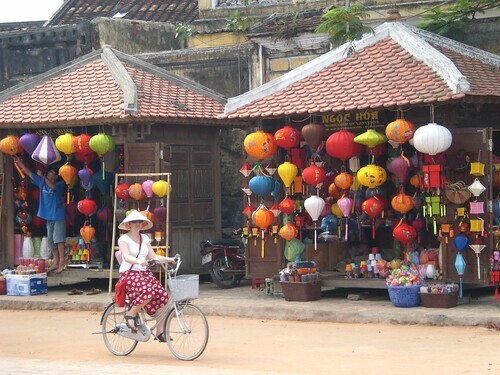 The colourful Chinese lanterns dotting the streets and the relaxed way of life really charmed me. Here, there were few motorcycles and a lot of people got around either on foot or by bicycle. 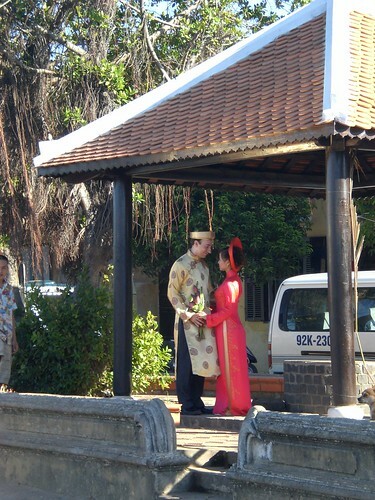 … while their costumed wedding party awaited. And just before dinner I spotted this restaurateur picking his nose outside his very empty joint. I wonder why no one patronised his cafe. 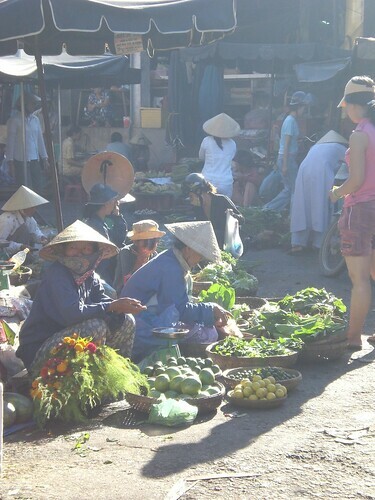 I headed on towards the market where lots of yummy sights and smells awaited. The sheer variety of fruit, vegetables and herbs made me yearn for a kitchen to whip up some food inspired by the local produce. I settled with having their local snacks instead. First, there were these odd little pancakes, reminiscent of the Indian appom. The tiny cakes were small enough to pop into the mouth whole and were crispy. The greasiness was countered by the shredded vegetables and herbs and the whole ensemble completed with a spamstick and a mystery-meat ball. It was a very satisfying starter. A short wander away was this version of bun. The thick rice noodles were bespattered with thick sweet sauce a bit like the stuff at home that’s put on yong tau fu, just quite a bit more savoury. It was much nicer with the hot sauce and the hotter yellow chillis. Yet another odd dish was this plate of assorted steamed dumplings. I wasn’t particularly impressed even though the guide book said something about “white rose” which was supposed to be shrimp encased in rice paper of sorts and steamed. 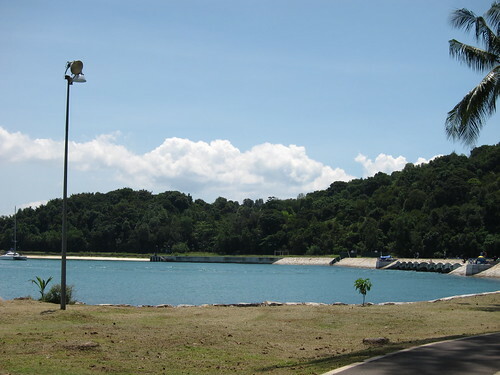 It was more like soon kueh with slightly drier skin. Not bad when hot but not much more than not bad. 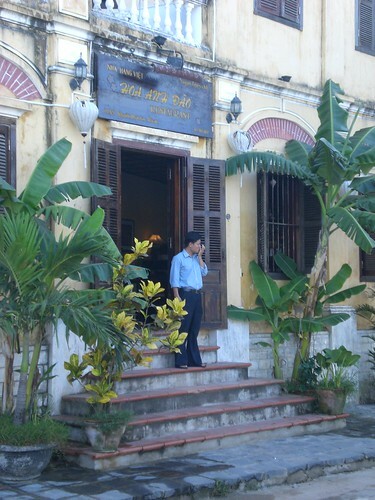 … and found myself in a little porch with a bowl of cau lau in front of me. 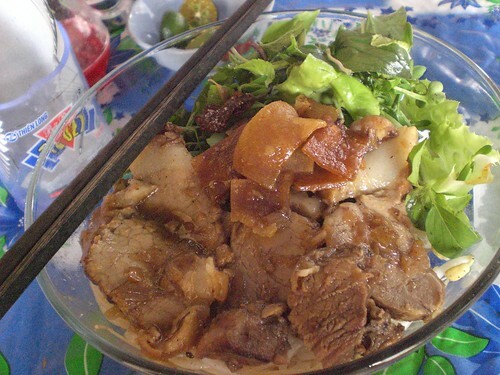 This is a Hoi An specialty that involves flat yellow noodles being smothered with braised pork and topped with lime juice and the usual herbage. It’s finished off with crispy fried rice paper bits and tastes really yummy, though very much reminding of what I do at home with leftover braised pork. 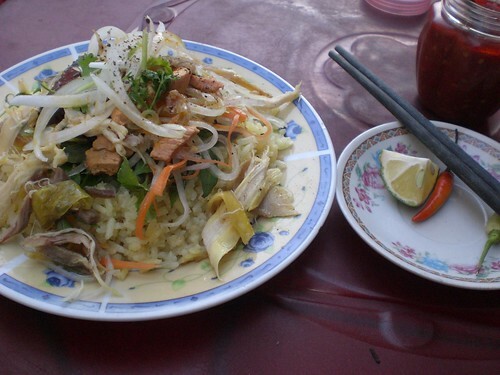 The best dish I had in Hoi An was the chicken rice, thankfully not featured in the guide but chanced upon on the street. The rice was cooked with chicken stock, just like Hainanese chicken rice at home. 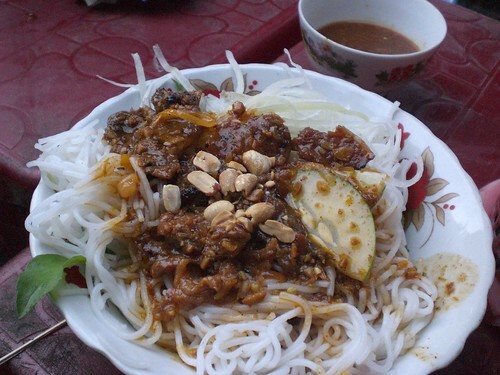 Unlike the stuff at home, it was topped with a whole variety of oddities like boiled pork, beansprouts and herbs. Not to mention, the chicken was just the shredded type torn apart with fingers. The flavour was amazing. It was an epiphany to have incredibly aromatic, chickeny rice matched with herbs like coriander and laksa leaves. It was definitely a step up from Hainanese chicken rice. I’m sure some of you must be wondering why I hadn’t mentioned Vietnam’s national drink yet. The coffee here is thick, strong and incredibly sweet and milky with added condensed milk. And that’s the only way you should have it. 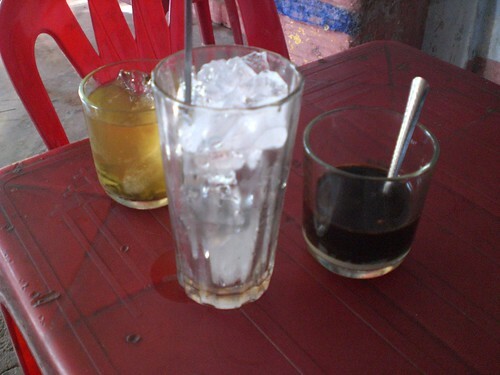 Ask for ca phe sua da and you get a tall glass of ice to cool it all down with. It’s wonderful on a hot day. When you’re done, chase it down with the green tea provided gratis. I first noticed this coffee place because of the many men perched on red plastic chairs watching TV in the morning. They disappeared by midday and I only ventured there in the afternoon to get a mobile plan top up card and a glass of coffee. After the first sip, I was hooked. 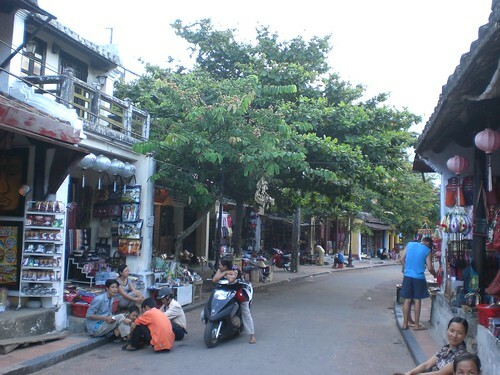 I spent every afternoon there enjoying my ca phe sua da, playing with the very cute puppy called Remain, and chatting with the proprietress about Hoi An, Vietnam and Singapore. I’d not cooked for a while. It was high time I dusted off some of the old recipes percolating inside my head and update them. One of them was this recipe for stuffed chicken wings. I last made them yonks ago back in my university days and never since had the time nor inclination to make them again. The chicken wings are made by taking the wing part and removing the two little bones inside, keeping the skin and meat pretty much intact. 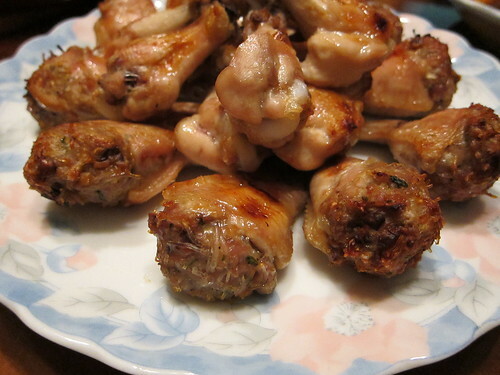 Then the cavity is stuffed with an aromatic minced meat mixture and the wings baked till golden all over. Sounds simple to do, but the deboning bit can be very tedious. The trick is patience and taking it slowly by popping the bones out of the joint and slowly cutting the meat off the bones with a pair of kitchen scissors. After getting the knack of one, the rest are easy. Still, it took me about half an hour to finish deboning 10 of these little fellas. For the filling, I tried to add a bit of Thai flavour by adding kaffir lime leaves and coriander. I’d imagine variations along the lines of adding water chestnut and cloud ear mushrooms for a more Chinese flavour. Or using curry powder and cooked potato for a slightly more local Malay-Indian touch. Try it and go crazy with the variations! Combine the stuffing ingredients and mix well. Stuff into the chicken wings and round off the top, being careful to push all the ends of the tanghoon into the meat mixture. This stops it from drying out and burning in the oven. Combine the glaze mixture and stir till the sugar dissolves. Paint over the mixture on the wings and, if using, the drumlets. Place onto a foil-lined baking tray and bake for 30 minutes, turning half way through, till golden brown. Serve with a squeeze of lime on top. 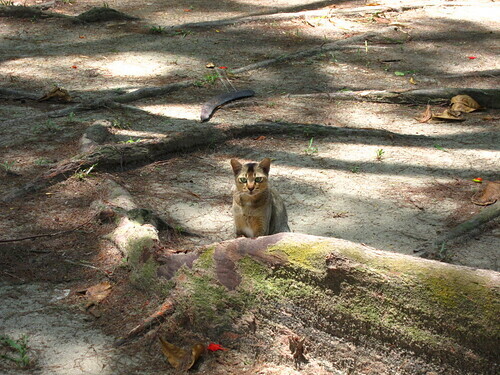 DC and I went to check out St John’s Island over the weekend. 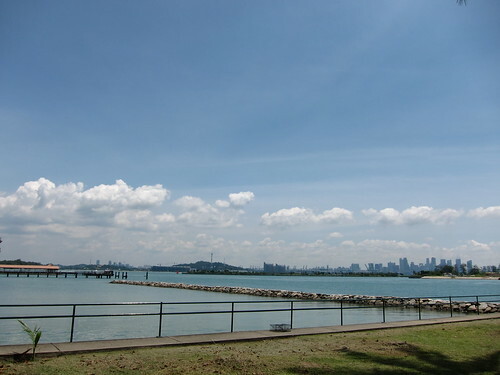 We hopped over from Marina South Pier by ferry. The 45 minutes ferry ride was comfortable and painless compared to the earlier hassle of finding parking at the ferry terminal. It was one of those incredibly hot yet lovely days and it showed off the island beautifully. 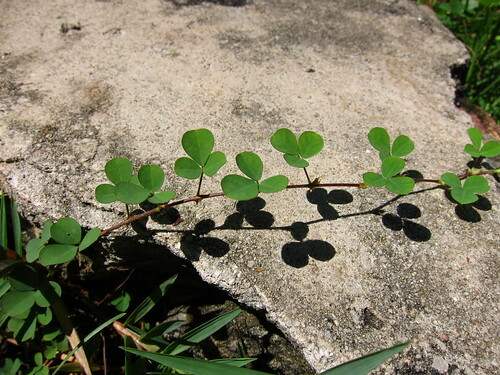 The sky was blue, the clouds fluffy white and the thick growth of trees a deep lively green. 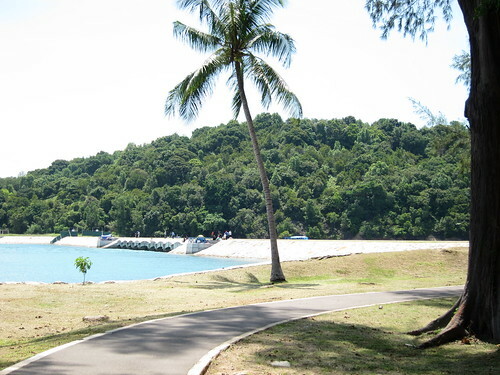 There wasn’t a great deal to the island, only a research centre for marine studies and a holiday camp. 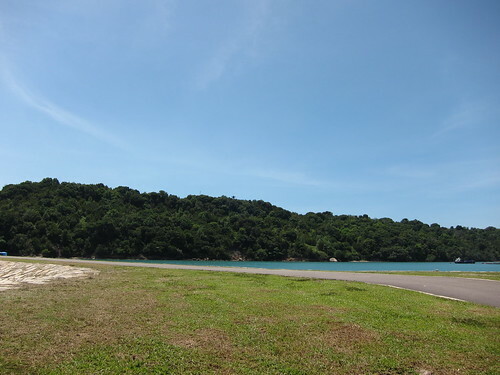 The rest of the island that was accessible to visitors was pretty much a little park, probably equivalent to a zone or two of East Coast beach. Still, it was a lovely walk and surprisingly not quite as hot as we expected as most of the way was pretty shady especially a bit further from the beach. It was a lovely little bit of Singapore that was a nicely contradictory combination of well-kept park and forgotten bucolism. 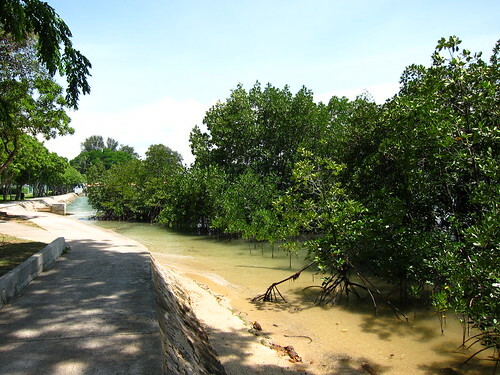 There were some mangroves along the coast standing upright in the water that was so clean it was almost clear. Only the sand clouded it up slightly. 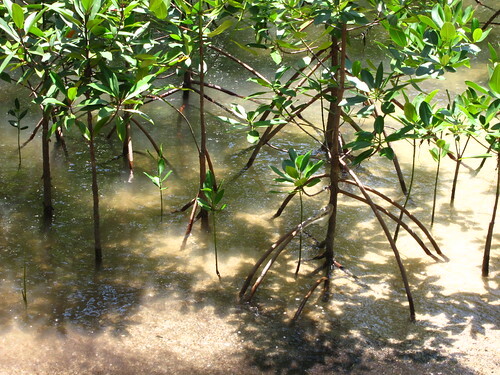 We spent a while peering at the little fish darting amongst the stilt roots of the mangroves. While there obviously weren’t any roses here, coming here was a good opportunity to stop and smell and observe. And of course test out the macro feature of my new camera! 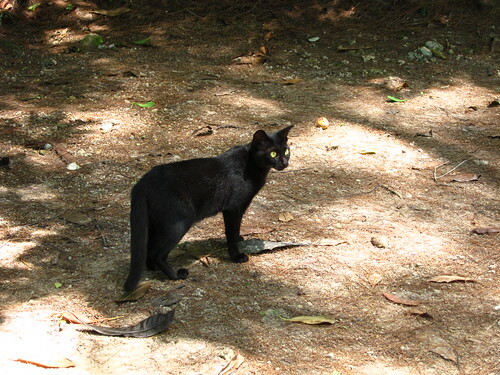 … and the spooky black cat with scary eyes. Then we adjourned to a shady park bench for a very refreshing Thai-inspired salad redolent of mint and lemongrass. The ever-enterprising DC whipped out cold drinks from a little styrofoam box and it completed our meal very nicely. All we needed to do next was head back to the ferry and home, wash up and have an afternoon nap. Bliss. Combine the fish sauce, soy sauce, lime juice and palm sugar, stirring to dissolve. I use pellets of palm sugar bought from Myanmar and leave it overnight in the fridge to give the sugar time to dissolve. Taste if you dare at this point to test for balance. It should be incredibly salty, fishy and sour all at the same time. Add more sugar to temper the sourness slightly and more fish sauce or soy sauce if it’s not fishy-salty enough. Don’t worry too much at this stage, you can tweak later too. 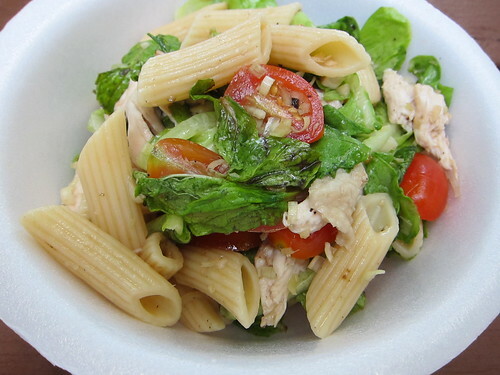 In a large bowl, combine the oil, shredded chicken and pasta, then stir in a few spoonfuls of the dressing. Now toss in the lemongrass, chilli and shallot and keep stirring till well combined. Tear the mint and lettuce leaves into the salad and keep tossing. Taste and add more dressing if necessary. Spoon into a plastic box for storage and keep as cool as possible for your picnic. 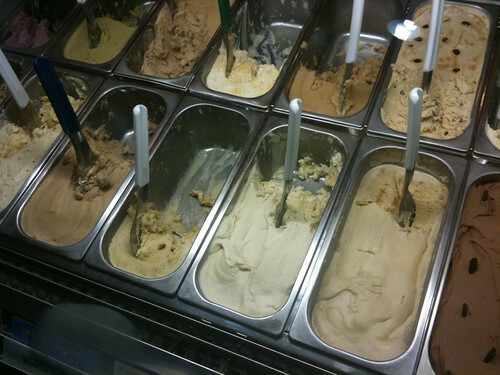 It’s great that there’s plenty of good ice cream around, especially with so many local ice cream makers around. Tom’s Palette is one of the lesser known yet one of the better ones. I like their inventive flavours and sheer variety. Each time I go, there’s an interesting flavour to try out. Over the Chinese New Year period, they not only had the usual “surprising” pineapple tart flavour, but also had stuff like tau sar piah flavour. I also like their generous portions. In this picture there’s ba bao cha (eight treasure tea) sorbet and my favourite salted caramel cheesecake. The ba bao cha flavour wa a flavoured ice, nothing particularly special except it being served as sorbet. Now the salted caramel cheesecake is something else altogether: incredibly rich and cheesy, with bits of crumbled cookie base and the most luscious salty caramel flavour. Other flavours of note are the wasabi lime (a combination that works amazingly well, but not in too large a dose!) and passionfruit sake for the clean flavours. Galta Gelato at Parco Marina Bay is pretty decent too. 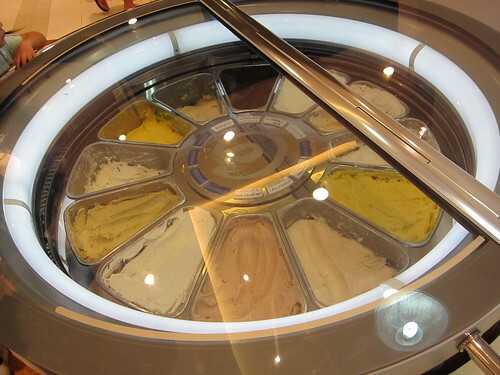 The fridge is a funky cylindrical contraption with the ice cream laid out in a turn table of sorts. The gelato is very smooth and drippy. 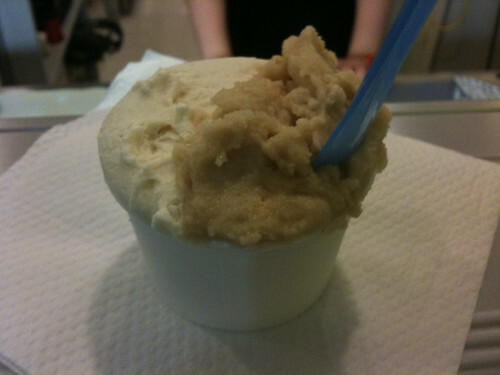 The fior di latte (milk) flavour was a bit too sweet for my taste, a pity. On the other hand, the ciocolate flavour was intense and unctuous, very excellent stuff especially considering that I’m not a big fan of chocolate ice cream. Try the other flavours and let me know whether they’re good! 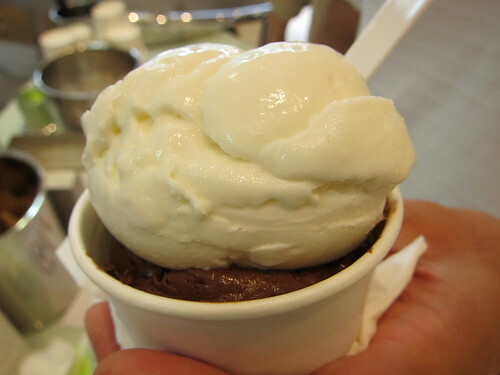 Last on the list is what DC think is the grandaddy of local ice cream: Daily Scoop. Their ice cream is always very smooth with the finest crystals, favourite flavours being coconut and butterscotch (I wonder what a combination of the two would be like!). 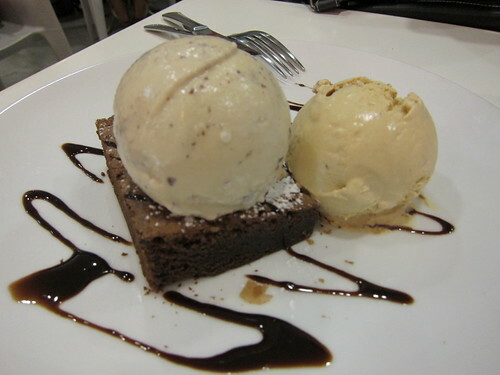 We were delighted to find out that they served desserts and found that the brownie went amazingly well with the Salted Mr Brown. Somehow the salted creaminess worked a charm against the foil of warm chocolate. The butterscotch was buttery and caramelly and lovely with the brownie too, but far lovelier on its own. Bliss! The things I learned from Thai cooking school stayed with me and two years since, I still cook Thai occasionally. Thai food is great mainly because there are quite a few dishes that are pretty healthy and easy to whip up in a jiffy. 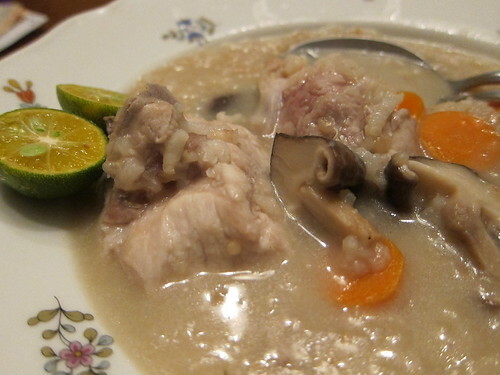 In this recipe, I’ve taken great liberties by turning tom kah kai, a coconutty chicken soup, into rice porridge. It’s so easy to make. I’d arrived home after work wanting something easy yet comforting and didn’t have much in the fridge. Cue freezer to the rescue. I pulled out my staples of chopped shallots, kaffir lime leaves, galangal pieces and lemongrass slices. There was also some unidentified meat that upon defrosting, turned out to be pork ribs. Tom kha moo it was then instead of kai. Vegetable-wise, there were mushroom and carrot languishing in the fridge, so it all came together quite nicely. All of it dumped in a rice cooker together with the addition of tom kha paste from a packet and I was good to go for the quick run while the whole thing bubbled together. Cover the pork ribs and carrot in water and simmer together with the galangal, shallots, kaffir lime leaf and lemongrass for 30 minutes. Remove the galangal, kaffir lime leaf and lemongrass. Add the rice, tom kha paste and mushrooms and simmer till the rice is cooked. Stir in the coconut milk and season to taste with fish sauce. Serve with a squeeze of lime to taste.